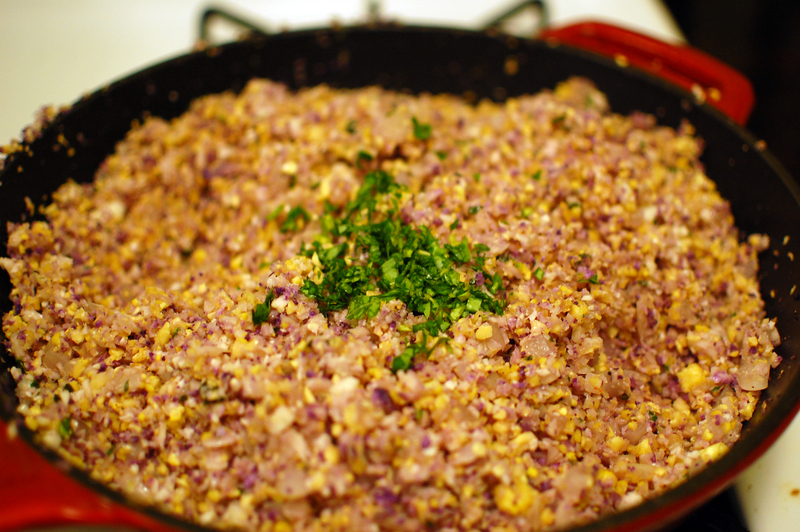 I have been wanting to make cauliflower rice for some time now. I’m not sure why it took so long to try it, but I am so happy I did because it was delicious. What a perfect way to replace a starchy side dish with a vegetable! Not only did the adults enjoy this, but the kids were spooning it down too. And when the kids like a vegetable dish we make, it’s obvious it is getting posted. I think the added fresh basil here makes it something special; quite perfect for the season. You can make this as a replacement for rice in any cuisine. This time we made it as a side dish with dinner, but if you want this as the main course, you can add some protein, more vegetables and make it into an Asian, Thai or Curried fried rice, yum! The best part was that it was easy. There was no pre-cooking or blanching. Aside from the quantity I was making, all you need to to is pulse it and fry it, then add whatever flavors and additions you’d like. Needless to say, this will be a go to in our house from now on. Now, are you ready to indulge? Saute your onions in butter until translucent. 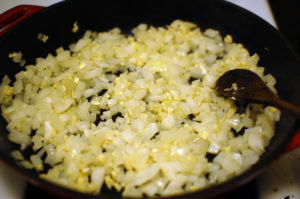 Add your garlic, mix and saute some more until fragrant. 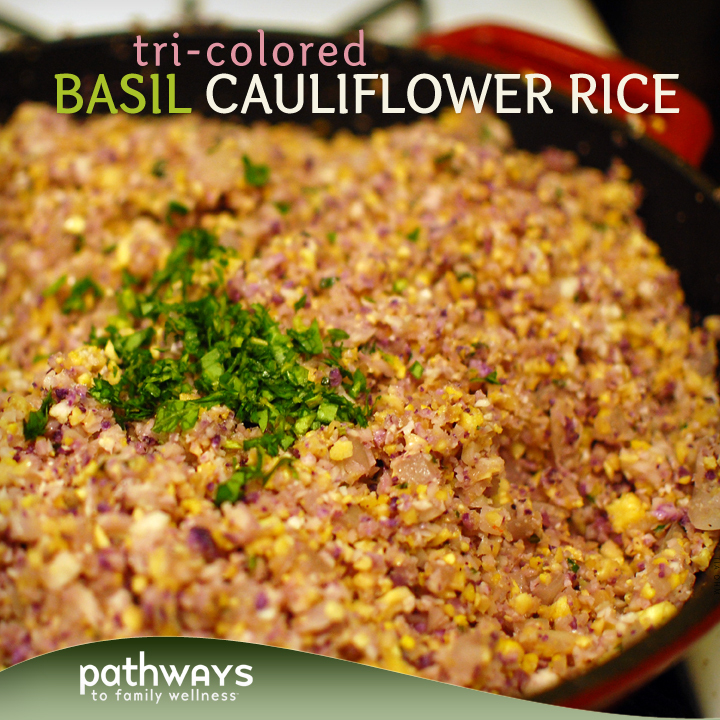 Add more butter, and your tri-colored cauliflower. Saute with tons of salt, pepper, garlic powder and even more butter until al dente. Then add your basil. Mix it up and let that basil cook a bit until you are ready to serve! 8 T butter, yes, that’s right. Chop cauliflower into chunks. In batches, pulse in food processor until it forms small bits. Set aside. Melt 2 T butter in a large cast iron skillet. 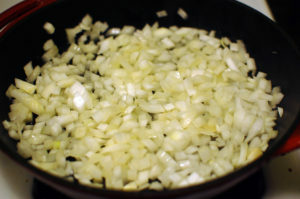 Add diced onions and stir. Cook until just turning translucent. 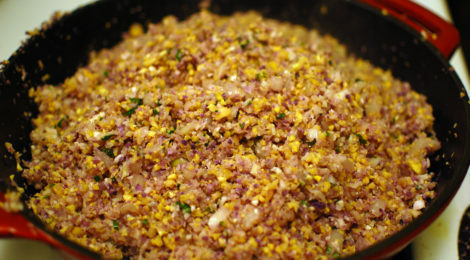 Add minced garlic and mix. Saute for about 5 minutes or until fragrant. Add more butter and then all your cauliflower rice. Stir to mix. At this point I continued to add butter as it seemed to dry easily. Continue to mix and cook. 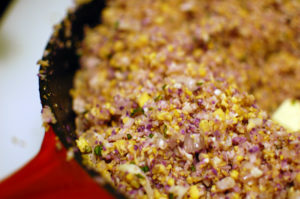 Add garlic powder, lots of salt and pepper and mix some more, cooking the cauliflower for about 10 minutes. When cauliflower is al dente, add your chopped basil and mix in. Let cook for a few more minutes and serve once cauliflower is cooked, but still slightly crunchy.